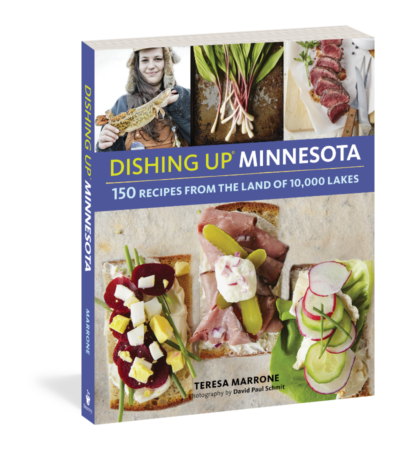 Adapted from Dishing Up® Minnesota by Teresa Marrone (Storey Publishing). Copyright © 2016. Photograph © David Paul Schmit. The loin is a long, boneless muscle that runs along either side of the backbone; it’s also called the backstrap. For this dish, use a venison loin portion that’s 10 to 12 inches long, which will weigh about 1 1/4 pounds. You can also use thick venison round steaks, or thick-cut steaks from an elk or moose loin; grass-fed beef steaks are delicious for this recipe as well. Step 1: Trim the venison loin of all silverskin and connective tissue. Season generously on all sides with salt and pepper. Set aside at room temperature while you prepare the grill. Step 2: For a gas grill: Preheat a two-burner gas grill on high for 15 minutes. For a charcoal grill: Prepare a medium-hot fire on half of the coal grate, leaving the other half free of coals. Step 3: While the grill is heating, prepare the glaze. Crush the juniper berries and peppercorns with a mortar and pestle until medium-coarse. (Alternately, place the spices in a heavyweight plastic bag and crush with the back side of a cast-iron skillet.) Combine the crushed mixture with the honey and butter in a very small saucepan. Bring to a boil over medium heat, stirring to mix. Step 4: When the grill is ready, turn off one of the burners of the gas grill, or spread out the coals of the charcoal grill, keeping half of the coal grate free of coals. Place the meat over the hot part of the grill. Cook until nicely marked on both sides. Move the meat to the cool area of the grill and brush with the honey glaze. Flip and brush the second side with the glaze. Cover the grill and cook, flipping and brushing the meat with the glaze every few minutes, until it reaches the desired doneness. Total cooking time will be 15 to 20 minutes; near the end, you may want to put the meat back over the hot area to give it a nice color. 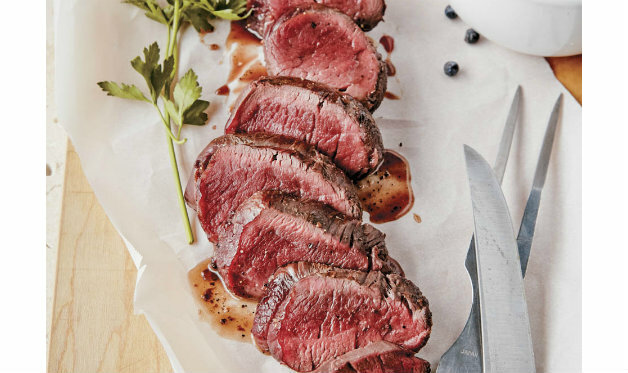 Venison is best when still somewhat rare; for best results, don’t cook it beyond 135°F (medium-rare), as the temperature will rise a bit during the resting period. Step 5: When the venison is a few degrees below the desired doneness, transfer to a serving plate. Sprinkle with sea salt. Cover loosely and let rest for 5 minutes. Slice thickly and serve.